The CORETECH™ RC4 Driver Cooling System provides effective body cooling for overheating drivers in multi-layer fire suits and hot cockpits. It controls heat stress, dramatically improving endurance, performance and comfort of the driver. 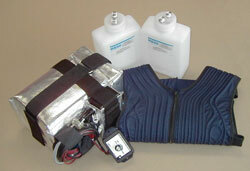 The RC4 Driver Cooling System consists of a TUBEsuit™ Vest, RC4 Cooler, five speed Remote Controller, a 4.5' umbilical water supply hose, a mounting kit, two ice bottles with quick connector caps and instructions. The RC4 Cooler generates the chilled water necessary to make the TUBEsuit work. The water is chilled by two pre-frozen ice bottles and is circulated through the TUBEsuit by a battery-powered pump. The water absorbs the body heat conductively from the skin of the driver and is returned to the RC4 Cooler for re-chilling. The Remote Controller is equipped with five-speed flow adjustment, providing the driver with control of the cooling rate. The TUBEsuit is connected to the Cooler through a system of convenient self-sealing quick connectors. The Cooler is mounted on the floor of the vehicle so the depleted ice bottles can be changed quickly.